As a teacher, it is important to highlight important figures in history and culture all year long – not just as a unit during the Black History Month in February or Martin Luther King’s birthday. At Woods Lake Elementary as well as schools around the country, we do have special events at this time, as well as other times throughout the year. For example at Woods Lake, our students participate in many varied cultural experiences. They attend concerts such as Gran Folklorico Ballet of Mexico, Washington Productions, Ellis Island (KSO), and art exhibits. They perform African Folk Tales, Native American Stories and do related art projects. We hold an annual evening International Dinner and school day Cultural Celebration showcasing the diverse cultures in our school with food and performance. Miss Nettie, Buddy Hannah and Von and Fran Washington are frequent guests sharing African American history and stories. Students also enjoy the annual Black History Quiz Bowl which has been a district wide event for many years. In the Kalamazoo Public Schools we believe that the contributions and concerns of our diverse population should be part of our curricula every day in every grade. The cause for which Dr. King devoted his life should be remembered, celebrated and acted upon throughout the year. To assist the classroom teacher in implementing projects and activities that will enhance the celebration of the Martin Luther King, Jr. Holiday, the teaching of the Civil Rights Movement and Cultural Diversity, we have listed a sampling of resources. Obviously, these are broad topics and there are many more resources available than can be listed here. Practice writing Martin Luther King. Dr. King spoke to people about his “dream” for freedom, peace and fairness for the world. Have children talk about their “dream” for the world. Color a picture of Dr. King speaking and write their dream for peace. Sing songs such as “Sing About Martin” (by “Miss Jackie” Weissman). Have students perform short plays about Martin Luther King, Rosa Parks. Discuss the Nobel Peace Prize and why it was awarded to Dr. Martin Luther King, Jr. Create their own definition of peace as part of a “Peace Chain” (Students write their own meaning of peace, copy it on to hands printed on different colored paper, cut out hands and make a peace chain in the room by joining the hands together). Participate in a choral reading of parts of Dr. King’s “I have a Dream” speech or use prepared work such as “A Choral Reading observing the Death of Martin Luther King, Jr.” by Gerda Lakritz, (The Instructor” March 1969, p. 80). Sing Songs such as “We Shall Overcome” and discuss the meaning behind the songs. Students write a dream speech of their own. Learn “Lift Ev’ry Voice and Sing” (can use book by James Weldon Johnson). For example: Civil Rights; Integration; Equality; Democracy; Boycott; Freedom; Racism; Discrimination; Protest; Freedom Segregation; Prejudice; Justice; Peaceful; Violence; Non-violence. Civil Rights (United Streaming) Lessons include typecasting, problem solving, action steps to reduce racism, prejudice, discrimination and stereotyping. We Are the Drum: Connections to the Underground RailroadSing, Dance and Paint the World. Tar Beach, Aunt Harriet’s Underground Railroad in the Sky, Faith Ringgold – artist and illustrator famous for her autobiographical quilts. There was an exhibit at the KIA several years ago. Follow the Drinking Gourd, story and pictures by Jeanette Winter. The Patchwork Quilt, by Valerie Flournoy. My Brother Martin A Sister Remembers by Christine King Farris. Martin’s Big Words – The Life of Dr. Martin Luther King, Jr. by Doreen Rappaport. 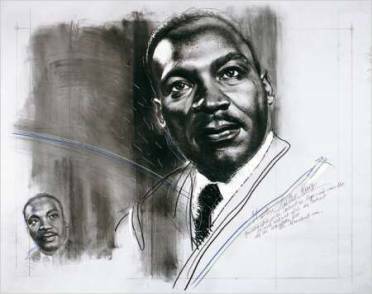 Martin Luther King by Rosemary L. Bray. paintings by Malcah Zeldis. Lift Ev’ry Voice and Sing by James Weldon Johnson, illustrated by Jan Spivey Gilcrhist. Malcolm X by Arnold Adoff. List of Important African Americans in History (KPS Social Studies Resource) Great African Americans Coloring Book by Taylor Oughton. www.unitedstreaming.com website containing video, lesson plans, activities and other resources (free 30 day trial period). Martin Luther King, Jr. Commemorative Activities Grades Pre-Kindergarten – Six Kalamazoo Public Schools, Dept of Elementary Instruction, Social Studies, 1990. Black Arts and Cultural Center (BACC) - Arts, Exhibits, Resources for artists and community leaders to come into classroom. Black Arts Theater Musical Events such as Blues series, Jazz, and Gospel. Community Events such as Scottish Festival, Russian Festival, Chinese New Year Celebration (KVCC)National Pan-Hellenic Council, WMU.